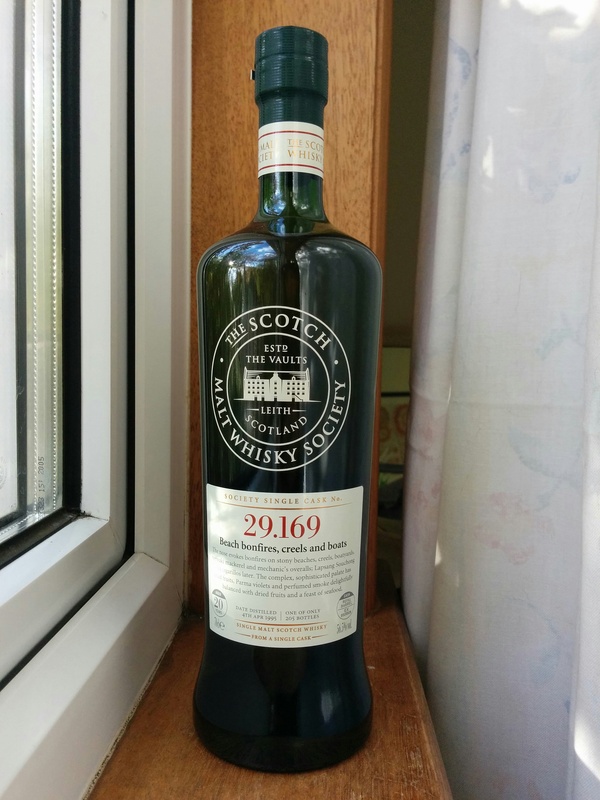 How coincidental that SMWS releases a 20 year old Laphroaig from a bourbon barrel just a few months after Laphroaig released their 21 year old FOL. Hmmm. Good timing. Before I delve deeper into this I want to point out that from the SMWS website and emails and tweets, this specific bottling was advertised as being from a first fill bourbon barrel. Which is also strikingly similar to the profile of the Laphroaig 21. However, this was an error. The 29.169 is from a refill ex-bourbon barrel which can be easily verified by looking at the label. Anyway, regardless of the similarities to the 21, this particular bottling has got enough going for it to be exciting for all of us. Independently bottled Laphroaig’s are not super common, it’s even less common to find one 20 years old or above and at cask strength and for less than 100 quid. So yeah with these powers combined this is one cool cat. Peanut butter, bacon, and melon sandwiches. Salty peatiness. Dried flowers like potpourri. Savoury bisque. Lively bright sticky sweet sour fruits. A bit citrus like Buddha hand fruit. The bitterness of the rind. Bit like cumquats. Balanced smoke that meshes with the sweetness well. Bit of Chinese herbal tea. Lots of complexity with all the flavours fusing and changing. Really nice mouth feel. Just coats the mouth with tingly bright fruitiness and the smoke from a ship engine. Cigarette smoke, fruit Syrup. Wood fire. Cumquats. Herbal tea. Long long and lingering. Mouth numbing like a shot from the dentist. What a pleasing dram! After a long hard day, this is just what I am looking for. The flavours are so upfront that they knock you back a bit. You don’t need to dig around for it. While the notes may make this out to be quite bizaare, all the elemnts really go well together. A truly well integrated whisky. Comparing this to the recently released Laphroaig 21 year FOL, I would say that this is more of a savoury perplexing dram whereas the 21 year old is more obviously fruity and spicy. At first I thought this one would have more subdued notes due to the refill barrel but it seems to be lively and fierce. Maybe as fierce as the 21 year old. Both are not as peaty as the younger Laphroaigs but if you are looking for a big peaty peat monster in an older Islay whisky then you might be mad.